This is a very simple pattern but also one of the larger projects I've ever linked. Most of my patterns can be completed in an hour or two. This one took me several days and two and a half skeins of yarn . . .though admittedly it was this completely awesome Lion Brand Jiffy yarn in denim blue that I just want to hug and caress over and over again. . .if any of you are planning to get me a Christmas present, take note: this yarn is spectacular! So anyway, this pattern is extremely simple. In some ways it is just a bigger version of my phone and camera cozy pattern, a much, much, much bigger version (ginormous as Coryn would say. . .I think she got that from the Fresh Beat Band, but she picks up stuff from all over so it is hard to say). Before you start, make sure you have a significant amount of the yarn you intend to use. I worked mine in the above mentioned amazing yarn, in half double crochet, with a size H hook. The size is easily adjustable. You work in a round up until the strap and you can make the strap any length you want. hdc in the second chain from the hook and in every chain until the end. In the end chain, hdc 3 times, turning around to work the back of the chain as demonstrated below, hdc along the entire bottom of the chain until you reach the end of the chain, hdc twice in the last chain. This is your first round. Hdc in the first hdc of the first round and in every hdc down the top of the row. When you get to the first turn hdc twice in the hdc at the end, then hdc down the other side of the round. Hdc twice in the hdc at the end of the turn on the other end. From here on, just work around and around, no extra stitches, one hdc in each space. It should quickly start to form a pocket. Here we have the pocket. To achieve the size of bag I wanted, I went around for 30 rows. The bag should have two definite sides. I chose to put my straps at the end of the row. So, stop, ch 1 and turn, hdc 6, ch and turn again, repeat until your strap has reached the length you desire. Here is my strap (the length I desired. . .omgosh, why does that sound dirty. . .that wasn't meant to sound dirty. . .uhhhh. . .it's long enough now). carefully line it up evenly on the opposite side of the bag. As I mentioned in my tote bag pattern, a good way to make sure you are placing your straps evenly is to fold the bag in half. Fasten off, weave under the ends and make sure your strap will hold up against a lot of weight (tug it a few times). There, you're done. Told you it was simple! Nice! I hope you found this project de-stressing. 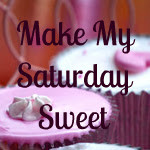 :) Thanks for linking up at the Make My Saturday Sweet blog hop!